Elizabeth, Anna George’s debut novel What Came Before looks like it might fit the ‘suburban noir’ genre. I’ll get back to you to confirm once I’ve read it. Nice review, BTW. Thanks, Angela. I just looked up What Came Before. Sounds excellent. Thanks for dropping by, Dawn, and you’re very welcome. I forgot about Caroline Overington. She probably does fit this category. And thanks for reminding me about Liane Moriarty. Of her books, I’ve only read The Hypnotist’s Love Story and I enjoyed that. I must hunt up The Husband’s Secret. Suburban Noir does have a ring to it, doesn’t it? 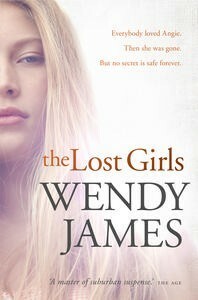 Good review Elizabeth … I must read Wendy James one day. I don’t read a lot of crime as you know but I feel I should read at least one by James. Suburban noir … I join others in saying I like it! Thank you! I think The Steele Diaries might be one of hers you’d enjoy. Thanks Lizzy (or whoever you are!). I’ll remember that. Agree that James is a great author of the sub genre but am almost vehemently opposed to calling it suburban noir. For me neither of those words are applicable…Honey Brown’s stuff for example often takes place a long way from the suburbs (so do several of James’novels for that matter) and the word itself can have a demeaning tone when used by some people. And none of this writing fits within the traditional meaning of noir which basically holds that you have a central character whose case/cause is hopeless and things will be virtually the same at the end as they were at the beginning for this person although the best writers (and film makers) often lull the reader/viewer into believing this time it might be different…there might be a happy ending. It is one of my bugbears that this word gets tacked onto anything else these days by marketing types who clearly don’t understand the term. My least favourite is everything coming out of Scandinavia being labelled Nordic Noir – even cosy crime writers like Camilla Lackberg. Sorry for the rant when I should be commenting on your review which I liked very much. You’ve teased out my issue with the Erin charachter very intelligently…I wasn’t nearly so articulate to myself when thinking about it but I do agree wholeheartedly. Bernadette, I love your rants, especially as they are always well informed. I’m happy to bow to your expertise in this matter (and thanks for clearing up what ‘noir’ traditionally stands for), though I do find he term catchy (as the marketing departments no doubt intend!). Have you reviewed the book and discussed Erin? If so, I missed it and must hunt it up. Thanks for taking the time to comment. It’s always appreciated. I’ve always been a fan of Wendy James so great to hear this review. My aunties and grandparents grew up/lived Northern Beaches way so I’m keen to get a sense of this location, as I often thought there was something unsettling about the place, beneath the slick surface. Looking forward to reading it. Love this notion of ‘suburban noir’. That’s an interesting impression about the setting, Kirsten (and perceptive, in my view). I look forward to hearing what you think of the book.